For HI readers who may not be aware, the wife of Scottish novelist, poet, and essayist Robert Louis Stevenson was a native of Indianapolis. Frances Matilda Vandegrift was the oldest child of Jacob Vandegrift (1816-1876) and Esther Thomas Keen Vandegrift (1811-1894). Jacob Vandegrift came to Indianapolis in 1836 as a young man of twenty. He returned to Philadelphia in 1838 to marry Esther. 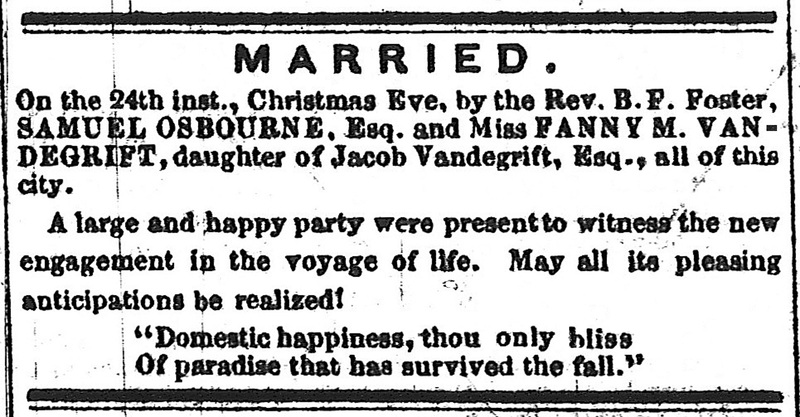 The newly wed Vandegrifts returned to Indianapolis soon after their spring wedding to make it their home. Jacob quickly established himself as a successful lumber dealer and respected citizen of the community. He was part owner of Kregelo, Blake and Company, which was on the north side of W. New York Street, alongside the Central Canal and the Cleveland, Cincinnati, St. Louis & Chicago Railroad (later called the Big Four). 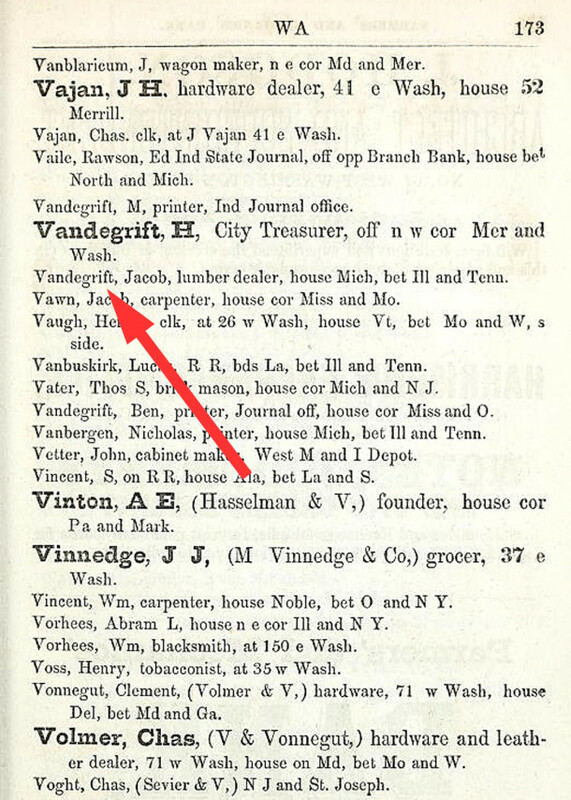 When Fanny Vandegrift was born, city directories did not yet exist, and photography had not yet come to America. This makes it difficult to ascertain street addresses or locate pictures of homes from the early years of Indianapolis’ existence. Nonetheless, I’ve attempted to piece together bits of information from a variety of sources to identify the locations in which Fanny Stevenson once resided. In anticipation of starting a family, the Vandegrifts built a home on Circle Street, across from what was in the city’s early years referred to as Governor’s Circle and Circle Park. 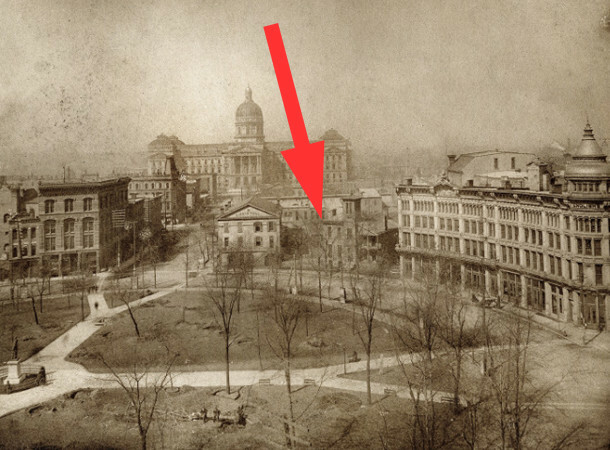 The residence was in the northwest quadrant of what we know today as Monument Circle. The house was next to Second Presbyterian Church, whose congregation had just erected its first permanent building on the corner of Market and Circle Streets. The church had also just hired a charismatic preacher who would become a well-known figure in United States history. The neighboring clergyman, Henry Ward Beecher, and Fanny’s father became lifelong friends. 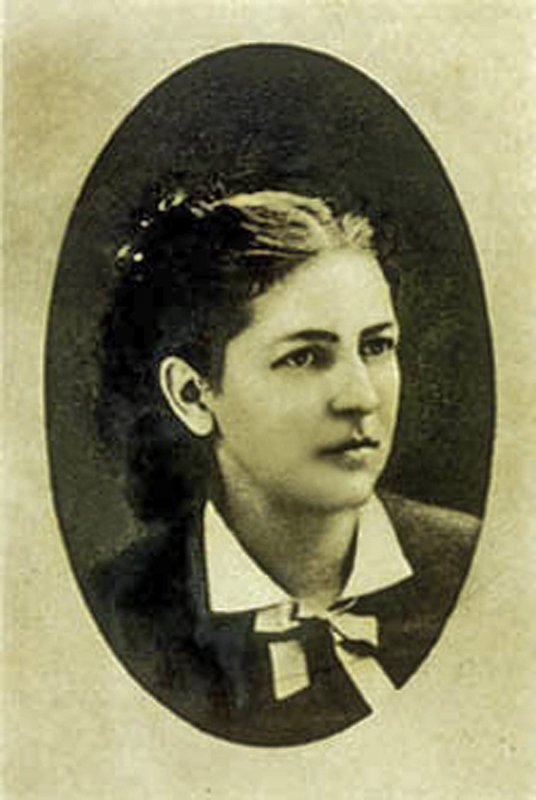 Fanny Vandegrift was born on March 10, 1840, in the family’s new home on Circle Street. At the age of two, she was baptized in nearby White River by Henry Ward Beecher. The Vandegrifts lived there almost twelve years. An interesting sidelight is that the Vandegrifts’ former home on the Circle was later acquired by William Hayden English (1822-1896). During the time that English lived there, he built an addition on the north side of the original structure, which included a three-story tower and rooms that opened onto covered porches. After English erected the English Hotel and Opera House adjacent to the residential property, he moved into a suite in the hotel. The former residence subsequently housed organizations or businesses until it was razed for the expansion of the hotel, which ultimately occupied the entire northwest quadrant of the Circle. In 1948, the English Hotel was demolished, and in 1950, a J. C. Penney Co. store was built on the site. 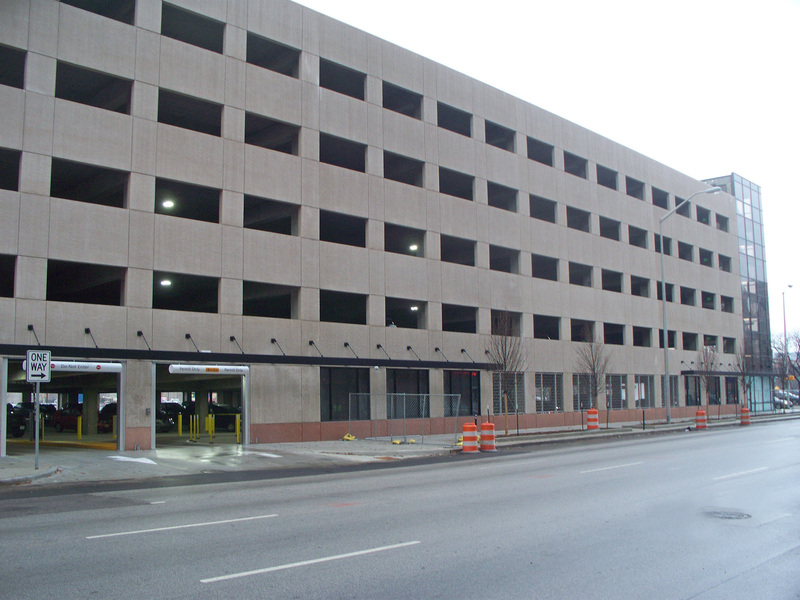 Today, the remodeled building at 120 Monument Circle houses the health care provider, WellPoint. The English Hotel and Opera House was the subject of a 2011 Historic Indianapolis “Then and Now” article, which you can read here. In 1851, Jacob Vandegrift built six attached brick townhouses on the southwest corner of Michigan and Illinois Streets. This was only four blocks north of their first home on the Circle. The Vandegrift family lived in the second apartment south of the corner for a brief period. The building was known as “Vandegrift Row” and was a landmark for more than seventy years. It was demolished in 1922. 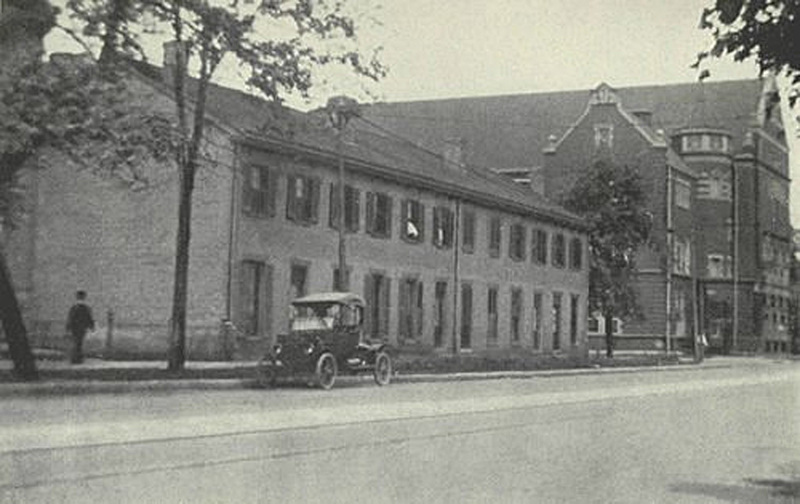 The Indianapolis Mannerchor Hall, which was at 502 N. Illinois Street, can be seen in the background of the photo below. 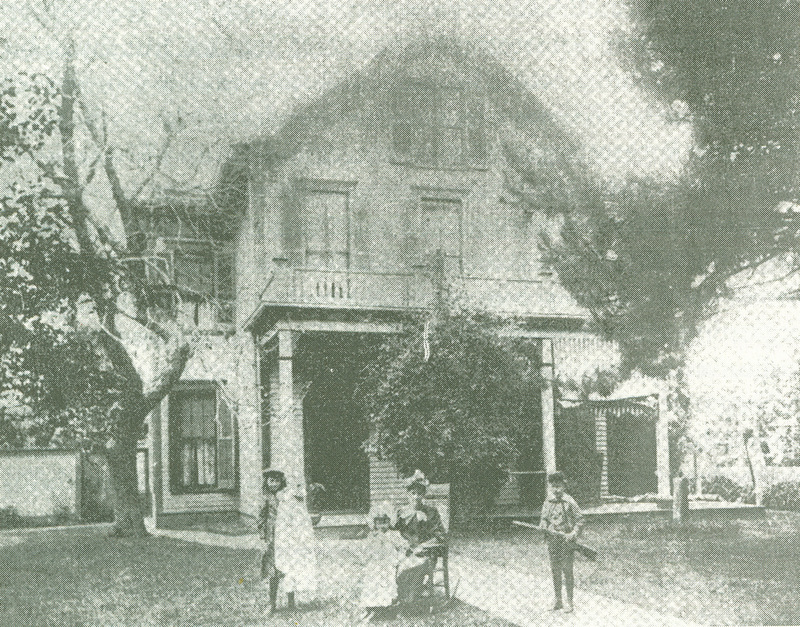 The Vandegrift family’s third residence was a single-family residence on the south side of Michigan Street between Illinois Street and Tennessee Street (later renamed Capitol Avenue). The family was living there at the time of the 1855 city directory. If it still existed, the home would have an address of approximately 111 West Michigan Street. On December 24, 1857, when Fanny was just seventeen-and-a-half years old, she married Samuel Osbourne, the twenty-year-old secretary to the Governor of Indiana, Ashbel Parsons Willard. Osbourne had attended Indiana Asbury University (now DePauw) and was the great-grandnephew of frontiersman Daniel Boone (1734-1820). The wedding took place in Fanny’s parents’ home on W. Michigan Street. 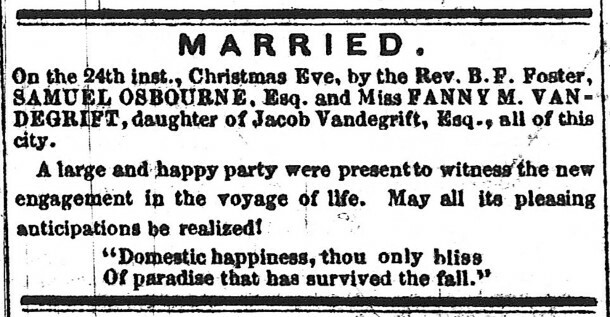 Different dates for their wedding are reported in various biographical sources, but a notice in the Indianapolis Sentinel on December 28, 1857, clearly described the nuptials as having taken place on Christmas Eve. Immediately after the 1857 wedding, the couple stayed in one of the brick apartments in the townhouses that her father had built on N. Illinois Street, just south of Michigan Street. Today the former location of “Vandegrift Row” is part of the recently constructed mixed-use project called Block 400. 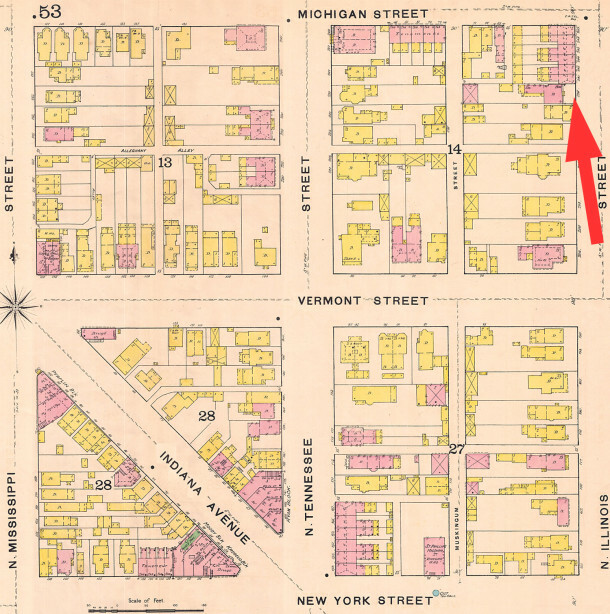 In the 1858-59 city directory, the Osbournes were listed at 16 N. California Street, which was six blocks west of Meridian Street and just north of the National Road or Washington Street. 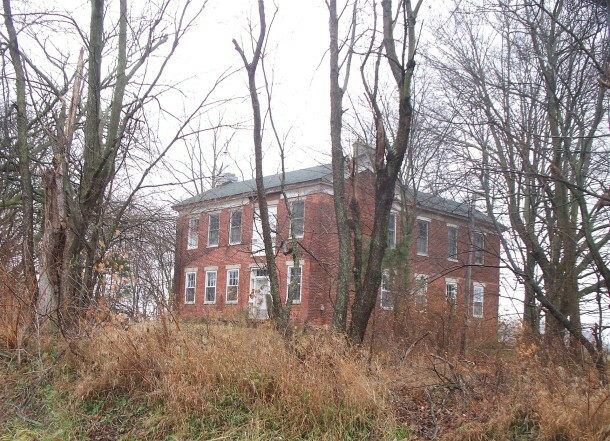 The single-family home would later be replaced by an Indianapolis Public School, namely Oscar C. McCulloch School 5. Today that is the location of the Indiana State Museum. 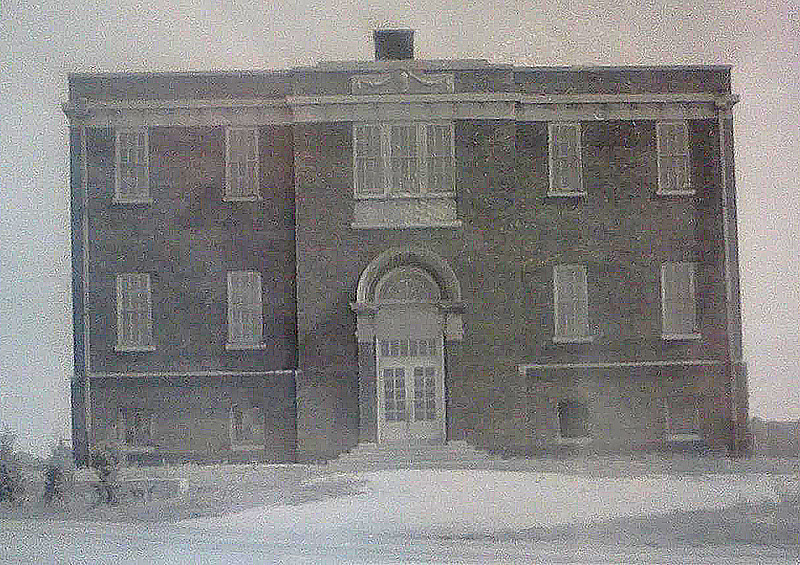 The façade of the razed school has been reconstructed inside the museum. In the 1860-61 city directory, the Osbournes were listed on West Michigan Street between Illinois and Tennessee (now Capitol Avenue). In the 1863 city directory, the Osbournes were listed at 236 N. Illinois Street, which after address renumbering at the close of the 19th century became 436 N. Illinois Street. In 1861, Jacob Vandegrift’s lumber yard burned. He took that opportunity to get into a different line of work, becoming a purchasing agent for the Vandalia Railroad. That same year, Jacob and Esther bought a 180-acre farm in Hendricks County, which included a two-story brick home that had been built in 1845. 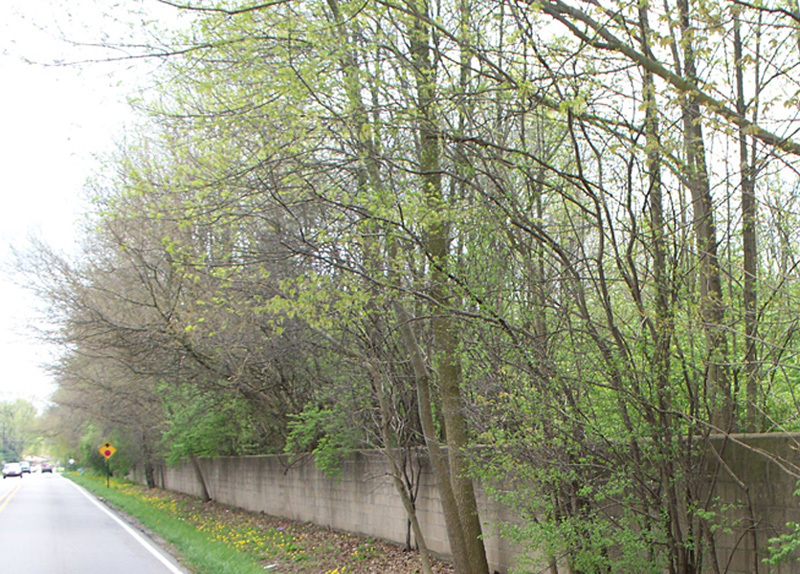 Located between Danville and Clayton, the quiet country lane that the Vandegrifts referred to as “Hill Road” in their day would eventually be known as Indiana State Road 39. Within a couple of years the Vandegrifts would leave the city and move to the farm, where the parents would remain for the rest of their lives. 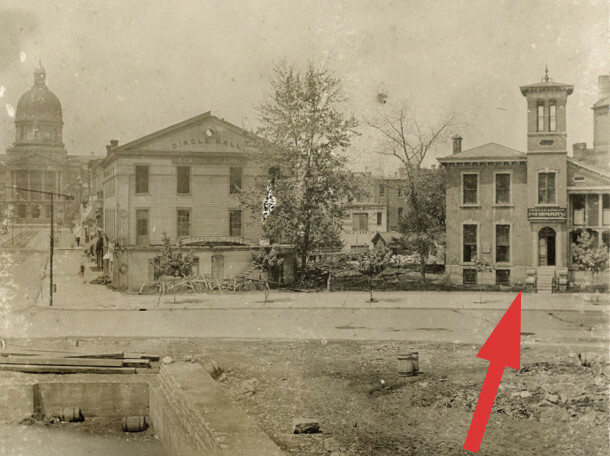 About 1862, Jacob Vandegrift built two homes side by side on Tennessee Street (now Capitol Avenue), just north of St. Clair Street. Sam, Fanny, and Isobel lived in the south home, and Fanny’s parents and younger siblings lived in the north home. They were there only a short time before the Osbournes moved to California, and the Vandegrifts moved to the farm in Hendricks County. An interesting sidelight to the history of these two Osbourne and Vandegrift homes on Tennessee Street is that they were purchased about two decades later by the future Mayor of Indianapolis, Thomas Kingsbury Taggart (1856-1929). The Taggarts lived in Samuel and Fanny’s former home for about five years. Taggart then moved the Osbourne house about 150 feet west of its original spot, from the northwest corner of Tennessee and St. Clair Streets to the northeast corner of Mississippi Street (now Senate Avenue) and St. Clair Street. In 1893 and 1894, Taggart built a much larger and more impressive home for his family on the empty lot. The Taggarts lived in the new residence until 1912. The Taggart home at 410 N. Tennessee Street (later 410 N. Capitol Avenue and still later 810 N. Capitol Avenue) was the subject of a 2011 Historic Indianapolis article, which you can read by clicking here. In 1913, the Kahn Tailoring Company demolished the (barely!) 20-year-old Taggart home and built a 4-story commercial building on the former site of the Osbourne, Vandegrift, and Taggart homes. The building was home to Litho Press from 1953 to 2008 and is currently being converted to an apartment complex called 800 North Capitol. After serving in the Union Army in the Civil War, Samuel Osbourne set out for California with Fanny’s brother-in-law, George S. Marshall, who was hoping to find a cure for the tuberculosis he had contracted during his service to the country. George died en route to California, but Samuel continued on alone to their intended destination. Sam wound up staking a claim on a silver mine in Nevada. He sent for Fanny and their daughter to join him. Fanny and “Belle” left Indiana in 1864. The Osbournes never officially resided in Indianapolis again, although Fanny would visit on many occasions during her lifetime. Samuel, Fanny, and Belle settled in Virginia City, Nevada, midway between Reno and Carson City. Unfortunately, Samuel spent a good deal of his time in saloons and brothels. Fanny decided she could not live with a man she did not respect and returned to Indiana. She stayed with her parents at their Hendricks County farm for about a year, wrestling with the decision of what to do about her marriage. Fanny returned to California in 1869 in an attempt to reconcile with her husband. They bought a home in Alameda County, across the bay from San Francisco. Sam’s philandering ways continued. By the time Fanny left Osbourne in 1875, Belle had two siblings, brothers Samuel Lloyd Osbourne and Hervey Stewart Osbourne. Fanny visited her relatives in Indiana whenever she crossed the country in her travels. The former Vandegrift farmhouse is still standing today, 178 years later! A young couple currently own the property and are restoring it. They have completed a substantial number of projects on the interior of the home and have many plans for the exterior, as well. 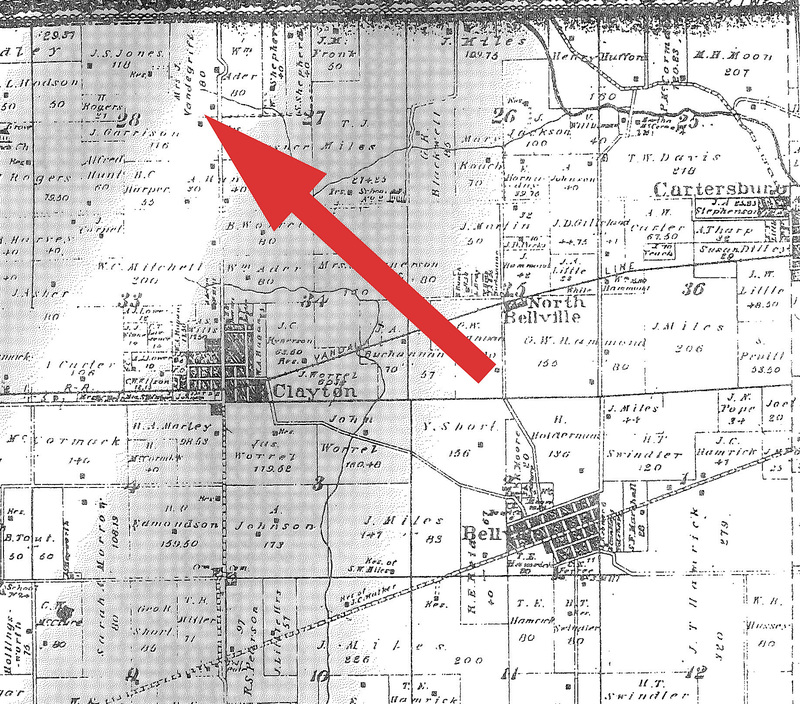 Although the HI Mailbag question asked only about the locations of Fanny’s homes while she lived in Indianapolis, I think the places she lived after she left her hometown would be of interest to readers, as well. Those who find the history of Indianapolis to be interesting probably also appreciate knowing about the places to which people who were originally from Indianapolis went. Due to the length of the current article, I have decided to devote two columns to Fanny Vandegrift Osbourne Stevenson. Part II will discuss the places she lived after she left Indiana, which you can read here. Sharon, I really appreciate all of this information and am looking forward to Part 2. Years ago I tried to connect at least some one in the van de Grift family to Crown Hill but couldn’t find any sure connections (nor to Osbourne). 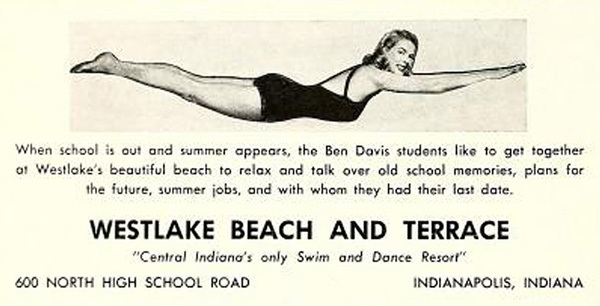 Their move to Hendricks Co. may explain why. I haven’t read them, but I did find a couple of books about Fanny and Robert’s relationship and even a book or two that they co-wrote, all available for download. Looking forward to the Robert Louis Stevenson connection. The first book I ever owned was A Child’s Garden of Verses. Fabulous documentary! I pass the Vandegrift house (Clayton) quite often and loved reading about the family.